You thought 6-5 blackjack was bad? Sporting Index were giving away more free money today, this time with their new blackjack game. Make ten bets for a stake of 20p or greater, the offer boasted, and have your net losses refunded up to £30. Sounded like a real bargain at first. Could it really be as good as playing nine coinflip hands for 20p – a maximum swing of £1.80 either way - and then putting somewhere between £28 and £32 quid on one final no-risk punt? Well no. It’s not really blackjack, of course, it’s a spread betting game based around a one-on-one hand of blackjack: if your hand wins, the result is 100 points; push, 50 points; lose, zip. Playing 20p per point on an even money proposition would involve a swing of about £10 on each bet. I’ll use a hand with nice round numbers as an example of how this works: the player is dealt 15 and the dealer shows a six and the market for this hand is 40-45. Bet higher than 45 to back the player’s hand, or lower than 40 to back the dealer’s hand. 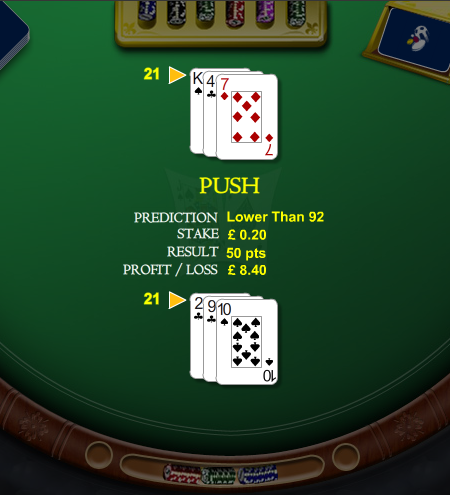 Because it’s impossible to push when you stand on 15, there are only two possible results after the hand plays out: zero or 100. If you buy this market (backing the player and betting on a dealer bust) you’ll win £55 or lose £45 for a £1 stake – effectively taking odds of 11-9 on the bust. Whereas if you sell (backing the dealer and betting that he’ll make a hand 17-21) you’ll lose £60 or win £40, therefore laying a much fatter 3-2 against the bust. You can defy basic strategy and take another card for the player’s hand if you like because busting is irrelevant - it just deals again without any money changing hands. Or if the hand improves, the market will change before you put any money down. You still get to bet after you hit up to 21 because you could still push for a result of 50 points (the market is 94-99 against any dealer card that isn’t a ten or ace – a choice of laying a hefty 99-1 vs taking a very lean 15-1), and you’re also still able to hit past 21. It took some doing, but eventually I managed to hit up to my first (and probably last) ever thirty-one! The five point spread on a market that only runs 0-100 is pretty significant. To cover both sides of the bet at £1 per point you’d need to bet £105 for a return of £95 regardless of the result. I make that a 4.76% house edge per bet! Although not unusually high for some casino games, that must be the highest edge you’ll ever see for something pretending to be blackjack. Even an eight-deck game paying 6-5 for a blackjack and with every possible unfavourable rule you can think of is better than this. See for yourself here, the very worst set of common rules weighs in at 2.48%. The best strategy I could think of to play this bonus was to only play bets with a small downside to qualify and then hope I had enough left for a coinflip bet at the end. It didn’t get that far, however. I bet lower than 92 for 20p per point (maximum loss £1.60) with the player making 21 against the dealer’s ten. The dealer had to pull an ace here to score zero (win £18.40) or hit up to 21 to push (win £8.40). It wasn’t an easy promo to get maximum value out of, and eight free quid is eight free quid, so I called it day there. Winner winner.